Calculating machine productivity is one way of measuring line productivity or factory’s productivity. If you are already measuring labour productivity of your sewing lines, you might be also interested in calculating machine productivity for your lines. It is easier to estimate production capacity of a line for the given products, if you have machine productivity data for various product categories. In this post I will show you how to calculate machine productivity of a sewing line. Productivity is the ratio of output and input of a process in a defined time frame. Divide garment output of a line by machine input. In the readymade garment production, factories measure productivity majorly as labour productivity and machine productivity. Labour productivity calculation method has been already discussed in this post. To calculate machine productivity of a stitching line you need following data. Example: A 40 machines line produced 400 pieces of shirts in 8 hours shift day. Machine productivity = 400/40 pieces in 8 hours. This method is applicable in calculating machine productivity for individual sewing lines as well as the whole factory. In case your factory shift time is 10 hour, you can measure machine productivity as machine productivity per 10 hour shift. Or convert 10 hours productivity into 8 hours machine productivity by following this formula. Exercise: Calculate machine productivity in 8 hours for following cases. 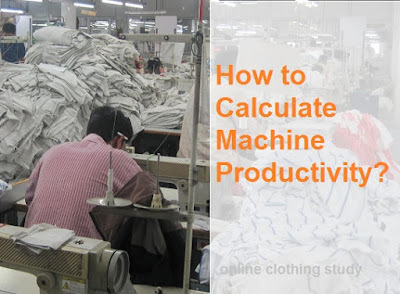 Calculating machine productivity and labour productivity in garment industry.